​It is a beautiful cool but sunny afternoon, Sesshomaru is outside in the back of the castle resting in his true dog demon form. He is near the hot spring, lying there with the sun beaming down on his puffy, white fur. He rests his head on his front paws that extend out exposing his powerful, sharp claws while his bottom and long white tail rest on his hind legs that are bent in a comfortable resting position for him. Nephra and Zephra always play around the empire or out behind the castle after they have had the morning sparing practice. This day the girls head out back and they see their father in his dog form relaxing in the sunshine as he often does and they race to him as Zephra says, "C'mon Nephra, I bet I will get up on top of father's back before you can." They run up and begin to climb up their father's fur to reach the top of his back. In dog form, their father is very big and large that it almost feels as if they are climbing a mountain as Nephra reaches the top just before Zephra. She laughs, "Ha I beat you," Zephra replies, "Nuh uh...I was first." Nephra replies, "Uggg, You can never admit that you lost Zephra, Oh never mind." The girls spend time on their father's back talking and joking, they play hand games with each other, slide down and climb back up thier father's furry body then finally, they also lie back on his fur to rest from all the playing. None of this bothers Sesshomaru as he is aware that his daughters are on his back playing and he continues to lie there awake but resting quietly. Zephra responds as she lies on her father's furry mane, "Father's fur is so soft, I could lay here for hours like this." Nephra replies, "Hey, let's wash father's fur...He likes that." Zephra responds, "yeah, Okay." They quickly climb down and find something to hold water in and a couple of cloths. They add fragrant Jasmine leaves to the water and they begin to wash their father's fur with the warm scented water. 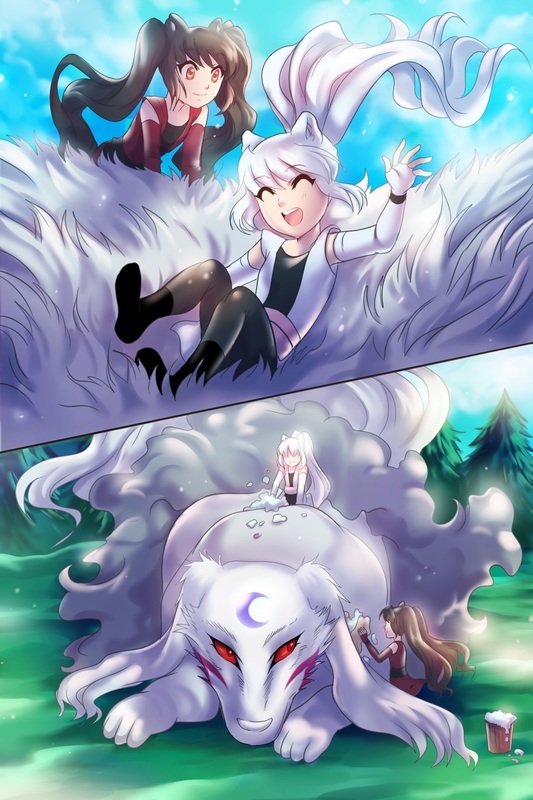 Sesshomaru loves the feel of the warm water running through his fur and the massage of the cleansing as he opens his resting eyes, remaining in a relaxed position while the girls continue on with getting him squeaky clean. Rin walks out to check up on the twins when she sees they are cleaning their fathers fur and she asks them, "How was your sparing practice today girls?" They respond in unison, "Fine" as they are both concentrating on doing a good job getting thier father's fur sparkling. Rin continues, "Girls, after your father is cleaned up...I want you to come in for lunch and allow your father to rest peacefully for the rest of the afternoon." Rin goes over to Sesshomaru's front, giving him soft scratches under his chin as he closes his eyes and lift his ears slightly from enjoyment of this. The girls respond, "Okay mother, we will." Sesshomaru nuzzles Rin's cheek and she giggles as she begins to walk away back into the castle, she reminds the girls, "Make sure you get behind his ears." Zephra heads with her water and cloth to do just that; he lowers and bends his head slightly allowing her to reach. When they are all done, Nephra replies, "All done, I think he looks great." The girls take their bucket of water and move it to the side as they begin to ring out the cloths they used and prepare to dispose of the water, at that moment Sesshomaru stands up from his resting postion and shakes off the excess water; being such a large dog demon his shaking causes a lot of water to sprinkle the girls heavily, he knows this and finds it amusing that he is able to catch the girls off gaurd, splashing them as they both shield themselves and yell, "AAAAH, FATHER!!!" He goes back into his resting position allowing the sun to dry his newly washed fur. Afterwards, the girls go inside to have lunch as their mother instructed, as they are eating, Heroshya walks through and without saying hello, he immediately asks the girls, "Where's father?" Nephra responds, "Hi, Heroshya! He is right outside, resting in the sun." He walks right past them and as he does, Zephra sticks her tongue out at him as she says, "That Heroshya, he's so rude, he doesn't even have the courtesy to say good afternoon." Nephra replies, "Oh Heroshya is not so bad, he just likes to act tough that's all." 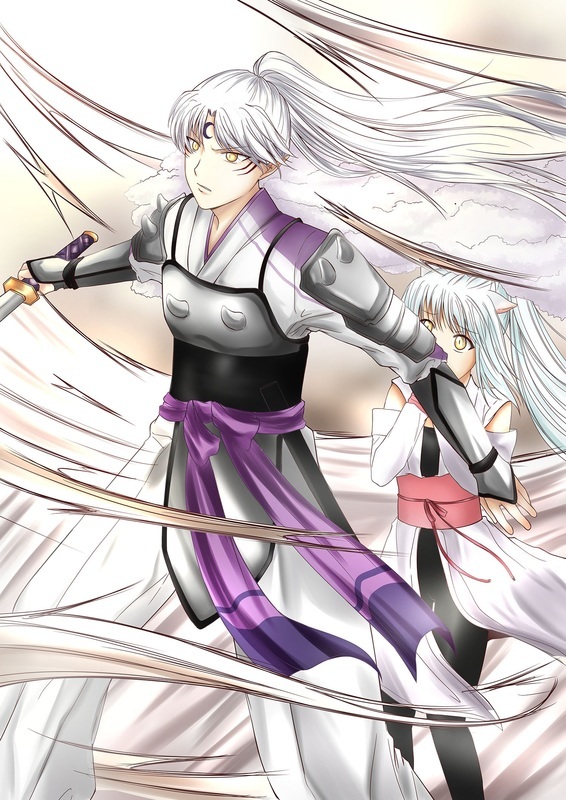 a few moments later as the girls continue their lunch, Heroshya and Sesshomaru (now in humanoid form again) walk in to the dining quarters from outside; they are in the middle of a conversation. Sesshomaru tells his son, "It is ridiculous, there is no need for you to join a group of demon fighters." Heroshya explains, "Father, I want to be known throughout Japan for my swordsmanship and fighting expertise, not known simply because I am son of the Western Ruler. These demons.... 'The Shadow Warriors' they are well known mersenaries, they accept the toughest of missions and they are some of the most prestigous demon fighters of Japan. If I could get into their group, I would feel a sense of accomplishment, as though I am gaining recognition from my own actions." Sesshomaru responds, "It would seem that your mind is made up." Heroshya agrees, "Yes.... well, I only wanted you to know what I was planning. I intend to meet with them tomorrow afternoon at the Western mountain to request entrance into their group." Sesshomaru inquires, "Request Entrance? Why would they deny a skilled warrior?" Heroshya responds, "It's my understanding that they are very strict regarding who they allow to join their crew. It will be difficult to gain their approval." Heroshya continues talking about this as he and his father walk out of the dining quarters strait ahead to the throne area. Nephra, who was listening to everything Heroshya said tells Zephra, "Heroshya would be a perfect addition to the Shadow Warriors. " Zephra was not listening as she responds, "Huh? What? What are you talking about?" Nephra replies, "Weren't you listening to anything Heroshya was saying?" Zephra answers, "No, who cares what Heroshya has to say?" Nephra says "I do..... this means a lot to him. I wish I could see how well his meeting goes tomorrow." Zephra sighs at her sisters behavior, "I really don't know why you care about Heroshya because he doesn't care about you and he never will." Nephra disagrees, "Can't you see that he puts on an act, he DOES like us but he tries to resist his feelings, that's why he ignores us so much." Zephra shakes her head, "If you says so." The next day, after sparing practice, Nephra tells Zephra, "I'll be back, I'm going to the Western Mountains. I've just got to see how happy Heroshya will be when they accept him into the group." Zephra asks, "What if mother or father asks where you are?" Nephra replies, "I'll return before that happens, I won't be long." Nephra runs off while Zephra stands there thinking to herself: I don't understand. Why does Nephra concern herself with Heroshya's issues? Hmm, she must really care for him but he'll never feel the same about her. Nephra goes to the Western mountain and hides behind a tree on the mountain where she can see and hear her brother talking with the demon warriors, she only wants to be there when they accept him into thier group but she soon realizes that the conversation is not going as she expected. She listens as the leader of the group says, "What made you think that we would want a young demon like you in our group?" Another one of the demons asks, "Hey, you are Heroshya aren't you? Son of Lord Sesshomaru?" A third demon states, "Ha, he thought we'd never deny the son of the great dog demon." Heroshya does not let their comments deter him, "I want to join your group because I am an excellent fighter, my skills will be of significant use to you." The leader of the Shadow Warriors responds, "You are a young demon therefore, I'm sure you lack the experience." Heroshya argues, "Do I not get a test? Assess my abilities and compare them to any other demon within your crew, If I exceed your expectations, then allow me entrance." The leader again disagrees, "Impossible, the demons of my crew have yet to exceed my expectations, you most certainly have no chance at impressing me." Heroshya requests, "Allow me the chance to prove it." The leader responds, "Give it up kid, there's no way you're skilled enough to be a Shadow Warrior. Try again in a couple hundred years or so." At this point Nephra runs out from hiding, angry and disappointed that the leader will not give Heroshya a chance, she yells out, "How dare you insult my brother, you don't know him to say he's not good enough!! " Heroshya can't believe she is here as he thinks: Oh No, Nephra what are you doing!?? Nephra continues to yell at the Shadow Warrior leader, "He is an excellent fighter, skilled beyond his years!!" The demons are all shocked to see this little half demon girl approach their leader with such anger, one demon laughs, " Ha, So you get your little sister to fight your battle for you Heroshya??" All the demons laugh at the comment while Heroshya turns to Nephra and says, "What are you doing here!?" Nephra still very upset responds, "He can't talk to you like that, You are a great dog demon, just like father." Heroshya repeats, "Nephra answer me, Why did you come here? Don't you realize you're making the matter even worse for me!?" Nephra's eyes sadden and she lowers her head as she responds disappointed, " I only wanted to see you become a Shadow Warrior." One of the demon warriors thinks she is adorable as he pinches her cheek he replies, "Hey!! Heroshya she looks just like you only she's a cute little pup." Heroshya orders, "Nephra, go straight back to the castle right now and you're lucky I don't tell father you left the grounds without permission!" Nephra sadly turns to leave as her brother instructed when the leader of the group says, "Wait... Just a minute little girl. " Nephra turns around and he asks, "Let me ask you, How often do you see your brother in combat?" She responds, "Well, I haven't really." The leader then asks, "Then how are you able to speak of his figthing skills with such confidence?" She responds, "Because, I see him practice all the time, his technique is as good as our father's and no one enjoys fighting as much as Heroshya does, he was born to be a great warrior." The leader of the group notices Nephra's cute little sparing suit she is wearing and can tell she is in training herself as he asks, "What about you, do you enjoy battle as well?" Nephra responds, "No not really, I only fight when I need to." The leader is intrigued with Nephra wanting to know more, "And how are your fighting skills?" She explains, "Getting better each day but my father teaches us new techniques all the time. When we grow up, he will give my sister and I a sword made from his very own fang, just like Heroshya's." Heroshya and the other Shadow Warrior demons look on in amazement as their leader carries an on going conversation with Nephra. Heroshya interrupts, "Okay Nephra, That's enough chatter...back to the castle." Before she can respond, the leader of the group says, "Just a minute Heroshya, she is quite an interesting little lady, I'm impressed with her. She was bold enough to set me straight, showing no fear of approaching four huge male demons. She has her own fighting abilites and she seems to be very insistent regarding yours Heroshya. She has peaked my curiosity, I would like to learn more about her by testing her. I've never met a little demon girl with such determination to see someone else succeed." Everyone is a bit confused and Nephra asks in a suprised tone, "You want to test me??" The leader asks, "Would you be willing to allow me to observe your skills?" Nephra thinks for a moment and says, "I will go through any tests you want, however, if I pass them all successfully, I want you to allow my brother to become a part of your Shadow Warriors group." The leader responds, "You have a deal." The leader gives his hand to Nephra to shake as a binding of the agreement and she shakes his hand in return but Heroshya responds to the leader of the group, "No, Wait. What type of test do you plan for her? She's just a little girl, I won't allow any..." He is interrupted by the Leader, "These will be simple tests, No one here will attempt to fight her and she will not be in any danger, I assure you." The leader turns back to Nephra, "I have three tasks I would like to see you complete. The first is for you to go out to The Forbidden Cave and destroy the glass wall there, behind it will be a map, bring it to me. Nephra asks, "Is that all?" he responds, "Well,not quite...You must make it there and back with the map before one of my warriors, he will be trying to get to The Forbidden Cave and obtain the map before you do." The warrior responds, "Ha ha, good luck girl." he rushes off at demon speed intent on getting the map before she does. Nephra says, "I'll bring the map, just remember our agreement." She runs off at normal human pace, not using any demonic speed. One of the demon warriors comments, "She will never make it there first at that rate of speed. Why does she not use any demonic speed?" The demon leader responds, " She is wise to save her demonic energy for a time it is truly needed, for now she is utilizing only the stamina of her youth." He thinks to himself: My warrior is going to use up too much of his demonic energy, he's going to need rest soon." Heroshya replies to the leader, "When she returns, I'm taking her home, I don't want her going on any tests or missions for my sake." The leader responds, "Why not Heroshya? You are being a bit over protective of your sister, don't you think?" Heroshya explains, "I don't need her help and besides, my father will be furious if anything were to happen to her and I don't want to be punished or blamed for it if she is hurt or killed." The warrior leader smirks a bit as he secretly tests Heroshya, "So you are not worried for her safety but only worried of your father's wrath. In that case, allow her to complete these tasks, if she does well, you will become one of us but if she is hurt or killed in the process, then simply tell your father that you had no idea that she'd followed you here, It would be the truth and we will all vouch for you." Heroshya's eyes widen in surprise of the Leader's words, he doesn't respond and walks away. He begins pacing back and forth, one of the demon warriors notice as he quietly remarks to the leader, "He seems nervous." The leader responds, "Heroshya tries to hide his true feelings, he is worried about the girl, not of his father's anger." Meanwhile the demon reaches the Forbidden Cave and there is the glass wall that he needs to break into in order to get the map. He attempts to use his demonic powers to shatter the thick heavy glass but his power is a bit weakened from the demonic speed used to run there. He tries to break the glass and it only cracks a bit as he thinks: Urrr, my demonic energy is weakened, I'll find some heavy log to help me destroy this glass. He shoots back out in search of something heavy that will be of use to him but on a mountain, he is not having much luck causing him to need to search a while, allowing some time to pass. By this time, Nephra has reached the Forbidden Cave also. As soon as she sees the glass, she uses her demonic blast with full energy and power. The glass bursts into a million piece allowing her to walk directly in; she sees a napsack lying on the ground, she thinks: The map must be inside that napsack, she goes over to it and looks inside and she is correct as a rolled up map is inside. She is just about to leave when a crow demon with a large, long beak and sharp teeth squawks loudly and swoops down to attack, Nephra uses her finger whips to immobilize it by tying the big bird up. Her whips wrap tightly around it's whole body and once he is no longer a threat to her, she asks the demon crow, " Is this your map?" The crow squawks again and replies, "No, It belongs to my master." Nephra responds, "Where is your master, may I speak with him?" The crow squawks and answers, "He is no longer among the living." Nephra responds, "Oh, I am sorry to hear so but if he is now in the world of the dead, then he would no longer have any use for this map, does he?" The bird agrees, "I suppose not." Nephra inquires, "Yet you continue to remain here, guarding it. Why?" another squawk, "I guess, it is force of habit." She request, "Then please, may I take it? I was sent here to retrieve it but I won't take it by force because it doesn't belong to me." She uses one of her sharp claws to cut and undo the demonic whip that binds the crow as she continues to speak, "It would really mean a lot to me, If you would allow me to take it." The bird, now free, hops over to the napsack and takes it into his beak as he carries it over to Nephra suggesting she take possession of it. She takes the napsack and throws it over her shoulder as she rubs it's feathered head, "Thank you so much." The bird squawks, "Best of luck to you." Nephra waves as she rushes off and the crow flies free, no longer needing to protect the map. The other demon warrior finally returns a few moments later with a very large rock he was able to break off from the mountain but he soon sees the glass has already been broken and the map is gone as he realizes he has lost to a little demon girl. Meanwhile two Shadow warrior demons, The leader and Heroshya are standing by and waiting when they suddenly hear Nephra's voice, "I'm here, I did it !!" she goes straight to the leader of the group and hands him the map. "Here it is,I told you I'd get it." 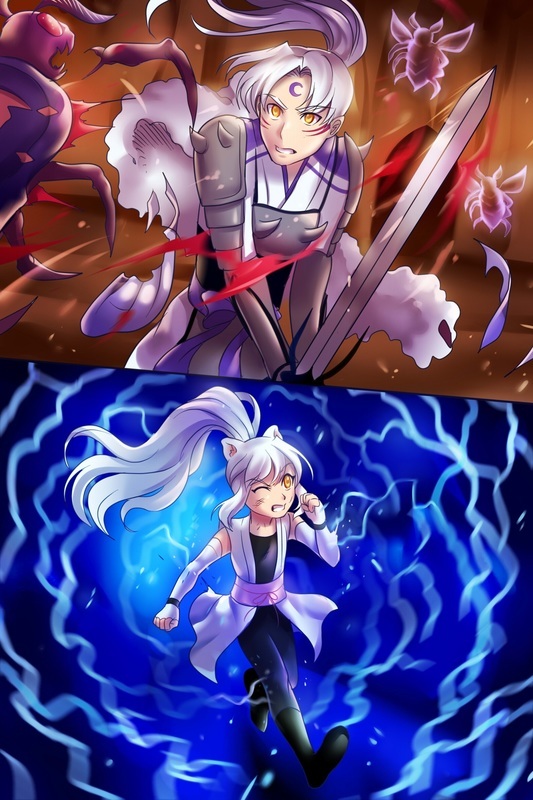 Everyone is suprised that she was able to beat the demon warrior on their team but the Leader is not at all surprised and he is even more impressed with her realizing that he was correct about her abilities and intellegence. Heroshya is ready for this to be over, "There will be no more tests, I'm escorting her home right now." Nephra says, "No, I made a deal with the Leader of the Shadow Warriors and I intend to go through with it." Heroshya argues with Nephra, "Father made me gaurdian over you, so you are to obey my orders Nephra, I said this is over...let's go now." Nephra responds, "I will endure father's punishment later, I've only got two more tasks to complete and you will be a Shadow Warrior just as you desire." She looks over at the leader and asks, "What is the next task?" The leader looks at Heroshya and says, "Well, this is interesting...you fear your father's anger but she is willing to take it head on for your sake." Heroshya says nothing but thinks to himself: I can't believe she just disobeyed my order and is willing to be punished by father, just so that I will get what I want. There's nothing I can do if she won't listen to me. I have no choice but to let her finish these tasks. Heroshya continues, "Fine." he then looks at the leader, "but the next task, we will all follow along, I need to be able to keep an eye on her." The leader agrees, "Very well. Come, we will all walk to the next obstacle together." The entire group walk together for several moments when they reach an area on the mountain that has a very high peak. He informs Nephra, "This will be your next task." He calls to another of his demon warriors and says to him, "Let's see if you will do any better than her last opponent. "The leader of the group points to the top of the mountain and says, "I want to see which one of you can reach the top first." Nephra looks at the tall rocky mountain top and enthusiastically says, " Alright, I'm ready, let's do it." Heroshya goes to Nephra and says, "That looks dangerous, Just forget this okay?" She responds, "Heroshya, you should have more faith in me, like I have in you." he informs, "Nephra, that's not....." He is interrupted when a demon warrior shouts as he points to the sky, "Take Cover, Look out !!". Everyone looks up and they see a huge dark ball coming directly at them. Heroshya quickly jumps in front of Nephra ready to strike the huge demonic ball with his sword once it strikes but instead there is a huge BOOM sound and the ground shakes but no one is hurt. They all open their eyes and look around realizing they are no longer on the mountain but instead now in a dark area that looks like a large tunnel. A shadow warrior yells, "What!! Where Are we?!" Suddenly they all hear a wild and sinister laughter, everyone looks back and there is a strange demon not with the group standing there. The leader demon asks angrily, "Who are you? What is this place?!" The strange demon replies, "Have you forgotten me already? It is me, Goju." The Shadow Warriors gasp as they seem to know the strange demon. One of the Shadow Warriors whispers to Heroshya, " Goju, was once a member of our group. He was right hand man to our leader until he was cast out because of his deception." The Shadow Warrior Leader yells out, "Goju what are you up to?! " Goju responds directly to the leader, "What am I up to you ask? Well I will tell you or should I say, I will show you just how useless the Shadow Warriors are without me, Goju... the magnificent." The leader responds, "The Shadow Warriors are stronger than ever, We have no use for you Goju !" Goju explains, "I will see if that is true. You forget, I helped train the Shadow Warriors, I know the limit of their abilities. Let's see how you will escape this dungeon maze but don't think It will be so easy, there will be some surprises up ahead." Goju laughs again as he disappears. Nephra asks, "How are we going to get out of here?" Heroshya responds, "Let's start walking. There has to be a way out, there's always an outlet." The group begins walking down the halls of the large tunnel that seem to have openings, the group has no idea which opening is best to go through but they eventually come to a dead end in which they must choose from one of three open exits that are present. One of the Shadow demons says, "Hmm, Now what?" Suddenly they hear Goju laugh loudly again and explain, "Hahaha, choose an exit mighty warriors....but be careful you don't pick the wrong one and meet with your death on the other side." Another Shadow Warrior replies, "Well that doesn't make the choice any easier. " Heroshya and the Shadow Warriors stand for a few moments and discuss the right choice to make, "The middle exit seems to have light behind it, It's probably safest." Heroshya responds, "That's ridiculous, none of these openings are safe. He's trying to kill you so all three openings will have a deadly challenge on the other side." The leader agrees, "Heroshya is right, we must be prepared to fight for our lives, no matter which exit we choose. The real question is should we split up or stay together?" One Shadow demon responds, "We're a team, I say we stay together." Nephra replies, "Well then let's not waste any more time, C'mon." Since it has already been established that all three doors will have danger on the other side, she swiftly runs directly into the closest door ready to face whatever is on the other side head on. Heroshya runs after her and shouts, "Nephra, don't run off on your own!!" The other demons and the leader are shocked at Nephra's actions as they all look at each other astonished. The leader finally orders, "Well, What are we waiting for? let's follow them. Who knows what they could be battling on the other side, they may need help." The other demons run into the closest opening and when they do they are presented with a giant three headed dragon whose roar is so strong and powerful they feel the ground shake. Heroshya guides Nephra to stand behind him as the three headed dragon continues to roar. Heroshya instructs Nephra, " Do not move from this spot until I've taken care of this dragon demon." Nephra tries to say something, "But Heroshya..." He interrupts, scolding her, " Do as I say Nephra! " Heroshya unsheathes his sword and begins to battle the dragon, wielding his weapon and jumping at it causing the dragon to swipe its claws and emit demonic fire from it's mouth. The other Shadow demons begin to join Heroshya in battling the dragon but they all have difficulty with the angry three headed demon that is attacking all of them with a fury. The dragon shoots demonic fire and Heroshya shields himself using his demonic blast but the force from the dragon's power causes him to fall to the ground. Heroshya thinks: This dragon demon's strike is so powerful, it'll be difficult to defeat. All of the Shadow Demons have the same problem. The dragon roars and swipes its deadly claws while stomping swiftly towards Heroshya and all the Shadow demons but they all quickly jump and run out the way of the dragons path as it continues to charge straight towards Nephra. Heroshya thinks: Oh No, Nephra is right in his path. As the dragon demon is wildly stomping toward her, she faces both palms of her hands out toward it , suggesting for it to stop as she says, "It's okay, slow down." The dragon demon understands her gesture and begins to slow down and stops running as Nephra slowly begins approaching it while still holding her hands out toward it, still speaking to the dragon, "It's okay, I won't hurt you." Nephra begins to stroke the dragons smooth slick skin and the dragon seems to warm up to Nephra as it's three heads all try to nuzzle her a bit. The group all look at each other in shock as the leader states, "I don't believe what I'm seeing right now." Heroshya goes up to Nephra and the dragon as she tells him, "See, it's not evil at all. It wouldn't hurt anyone." One of the demons inquire, "If it's so kind and gentle, then why did it just attack us?" Nephra lowers her eyebrows irritated at his question, "It didn't attack you until you all attacked first. It was only roaring when we approached because we frightened it." Heroshya asks Nephra, "Was that what you were trying to tell me before I began fighting with it?" Nephra smiles and nods causing Heroshya to feel bad for interrupting her as he thinks: I should've listened to what she had to say. I guess I can't help seeing her as just a bratty little kid. Nephra asks the dragon, "Hey, do you know how we can get back to the Western mountain?" The dragon's one head roars while the other two heads nods yes. Everyone becomes excited that the dragon may be able to guide them out of this dungeon, so Nephra walks beside the dragon as they walk to get back to the mountain. They walk for a bit of time as the dragon takes them around many twists and turns, the dungeon is a huge maze and one of the Shadow Warrior demon's replies, "This maze is ridiculous, we would have never found our way out but now we should be back at the mountain before night fall, thanks to Heroshya's little sister." The other demons agree and praise her, "Yeah," "Good job kid." She smiles and says, "Our dragon friend is doing all the work, not me." The leader explains, "Yes but only you knew that the dragon was tame and you were able to befriend it as our guide to lead us out of here. If you weren't a little girl..I would want you for our Shadow Warrior group." Heroshya hears this conversation and feels a bit of jealousy as he thinks to himself: Hmf, I can't believe it. The Shadow Warriors actually like Nephra better than me. I wish she would not have interfered in this. Nephra replies to the leader, " I'm only so wise from watching my father and brother in action. They are experts when it comes to getting out of what seems like hopeless situations." The leader inquires, "Heh, Heroshya didn't know that the dragon was harmless, he fought the demon just like the rest of us." Nephra answers, "It's because I'm here." The leader is confused, "What do you mean?" Nephra explains, "Heroshya's first line of business is to ensure that I'm safe, he acted in haste before using his demonic senses properly because he was afraid for my life." The leader says, "Oh, I see." Heroshya's eyes raise in surprise at Nephra's response to the leader as he thinks: How does she know so much about my actions and emotions? Or maybe she doesn't know, maybe she's making excuses for me. In either case, she's right...I can't let her presence here distract me. I have to utilize all of my senses and abilities properly if I'm going to get Nephra back home in one piece. They continue walking for a bit longer when Nephra says, "we're getting close to the mountain, I can smell it." One of the demon warrior replies, "You can??" Nephra giggles and replies "Yes." Heroshya adds, "But there's something else nearby. I smell and feel the energy of hostile demons approaching, prepare yourselves!" Just then a Shadow warrior demon is knocked to the ground as he shouts, "What the...What's going on?" The other demon warrior screams, "Ahhh, something bit me." The leader of the group says, "You heard Heroshya, guard yourselves." his comrade replies again, "But how?? I don't see anything. If there are demons here, they are completely invisible." The demons are flying at the group but invisible making it difficult to fight them off. Heroshya shouts out, "There are thousands of them!!" as he wields his sword killing them off with ease. Each time he strikes one with his sword they instantly become visible and die. Nephra is easily avoiding the invisible flying demons also as she ducks from one and claws another protecting both she and the dragon from the attacks. A demon warrior is again hit hard and slashed while another shadow warrior says, "WE don't have keen smell and hearing, There's no way we can fight off something we cannot see." Heroshya yells to Nephra, "I'll take care of these flying demons, Nephra....you continue getting everyone out." Nephra does as ordered, "Ok, C'mon....Follow me." They all attempt to run out of the dungeon to the mountain but they do not get far at all when suddenly the dragon will not go any further. Nephra tries to tug it but it won't go and she senses that it is afraid as she says to it, "What's the matter?" The dragon only roars. One of the demon warriors says, "C'mon let's just keep going without the dragon." He walks ahead a bit when suddenly his skin sizzles and sparks causing him to fall back and yell in pain, "Ah, damn...there's a demon barrier here. There's no way out!!" Nephra begins to walk up to the barrier and puts her hand through it, there is no sizzle or spark just a small amount of smoke when she removes her hand from the barrier. The leader asks, "It doesn't harm you?" She replies, "I'm half human, it doesn't harm me as much as it will you but It's still very hot inside, I'll have to run through it quickly. I can still smell the mountain and I can sense the demonic energy of the barrier so I know it's path is not very long." The leader informs, "I don't know if your brother would want you to do this." She explains, "I don't have a choice, It's our only way out. Heroshya will keep you protected from those flying demons and I will find a way to remove this barrier so you all can get through it." She runs through as swiftly as she can, using only her human abilities to avoid the dangers of the barrier. As she runs through, the heat from the barrier is slowly starting to take hold as she finds herself losing momentum. She is halfway through it now but unable to run fast. Nephra wants to rest but she does not stop because the heat of the barrier could kill her if she remains in it longer than needed; also she knows that the barrier will end soon because as she runs through it, the smell of the mountain gets stronger and stronger. Meanwhile, Heroshya is still battling the flying demons as the Shadow warriors stand by and one of them states, "I feel so useless, we can't stand by doing nothing while Nephra and Heroshya risk their lives." The leader says, "Really there is nothing we can do, we can't get through this barrier, that's for sure and we would only be in Heroshya's way if we tried to fight flying demons that we can't see,smell or hear coming. " They can see Heroshya from a distance as he wards off the flying demons skillfully. They are fast in approaching and attempting to manuever around Heroshya to get to the group but he is faster using his demonic blast as a shield and weapon causing some of the demons to go flying back while also weilding his sword or using his demonic laser eyes to kill them off all while they cannot be seen. The leader exclaims, "Amazing, he's exceptionally swift, outstanding with his sword and not afraid to risk his life for others. Most importantly, he knows what takes priority. When his sister is in danger, he is quick to action no matter what." Another of the demon warriors agrees, "It would be good to have Heroshya on our side in a tough situation." As Heroshya is fighting the demons off, his dog demon senses allows him to smell the barrier as well as sense the demonic energy from it just as Nephra could. He comes up with a plan to rid himself of these thousands of dumb flying demons that are only invisible and attacking due to the manipulation of another powerful demon..... 'Goju'. Heroshya runs at top speed toward the barrier as he yells to the Shadow Warriors, "Make way!!" The Shadow demons make room and move aside as Heroshya continues running at top speed toward the barrier causing the flying demons to take chase and follow him, He stops abruptly and ducks as the flying demons idiotically are flying so fast that they fly directly head first into the barrier being killed off once inside the barrier. All the Shadow Warriors standing near by catch on to what Heroshay's plan was and they know it worked when they see hundreds of sparks and hear the moans of the invisible demons coming from the barrier. Heroshya stands up once all the flying demons are destroyed and the Leader demon says, "That was very clever Heroshya. I would have never thought of that." Heroshya replies, "Well, they were just a bunch of worthless demons, it was easy to out wit them. Where is Nephra?" The leader explains, "She went on ahead through the barrier, she said because she is half human, it does not harm her and she would find a way to release it. Don't worry, she is a strong little half demon, she will be just fine." Heroshya quietly and calmly worries for Nephra that she made it through safely. Nephra is nearing at the end of the barrier because the smell the mountain is getting stronger however she begins to succumb to the pain and weakness that the barrier is causing. Although she tries to run fast her body begins to slow down and she stumbles to the ground, moaning a bit from heat as the demonic barrier is starting to be too much for her. While on her hands and knees, she motivates herself as she thinks: C'mon, you're almost there. You've got to release this barrier to help the others. She slowly stands and with every bit of strength left in her she forces her way through the hot barrier although her legs are uncontrollably wobbly causing her steps to be erratic. Nephra struggles on; she eventually stretches her arm out. She can feel the cool air of the Western Mountain and is relieved to know she has made it through the barrier but she finds it difficult to stand as she rests a moment, breathing a bit heavy while allowing the cool breeze to rush through her. As she sits there gathering herself she notices the scent of another demon near by whom she can also sense is using a lot of demonic energy. She begins to follow the scent of this demon when she finds him, she sees that this demon is obviously one of Goju's partners as he sits with his eyes closed; deeply concentrating to steadily keep the deadly barrier up with his demonic powers. When Nephra runs up, the demon comes out of his trance and is shocked to see her knowing she was with the group, he inquires, "How...How did you get here, It's impossible no demon could make it through this barrier alive." Nephra is still a bit weak as she says to the demon, "Remove this barrier; allow my brother and his friends to be released!!" He responds, "Ah...I see, you are a half demon. So that's how you got through. It still had to be extremely difficult for you though." She repeats, "Remove this barrier, I will not ask again." The demon laughs at the little girls threat as he says, "I'm afraid I can't do that, I have my orders...which are also for me to kill anyone that was lucky enough to make it out of the dungeon alive." Nephra and the Demon both strike each other at the exact same time, she using her demonic whip while he grabs hold of it and shoots the same power at her that the barrier consists of. She jumps out of the way to avoid his attack at the same time she twirls and attempts to kick him but there is not much power in her kick due to her legs are still not strong enough after leaving the barrier. He easily shields himself and blocks her kick causing her to fall back to the ground. The demon plans to finish Nephra off while also keeping the barrier running strong, he begins to approach her planning to pierce her with his sharp deadly claws that are also filled with the demonic power he uses to create his barriers. As he approaches Nephra lays there for a moment waiting for him to come close enough to her before she strikes, when he is right where she wants him, she uses her demonic blast to knock him as he goes flying to the other side uncontrollably slamming into the hard rock of a nearby mountain. Nephra thinks: His barrier may have weakened me physically but thank goodness my demon energy is still intact. Nephra stands up and feels a bit dizzy as she thinks: Oh, when will the effects of this barrier cease. The demon begins to stand and recover from being thrown against the mountain and charges toward Nephra again but before he can reach her the leader of the Shadow warriors attacks him in mid charge, grabbing the demon and slicing him in two using only his powerful claws. Nephra sees the other Shadow demons, the three headed dragon and Heroshya all begin to arrive at the mountain, they all run to her aid as she responds, "I'm so glad to see you all made it out." One shadow demon responds, "Yeah, thanks to you. How'd you release the barrier?" Nephra explains, "I'm not sure but I think when I used my demonic blast and the demon hit the mountain's rock really hard, it broke his concentration which allowed the barrier to break." Heroshya asks her, "Are you okay?" she explains, "I still feel so weak, it's difficult for me to stand, walk, or even jump but my demonic energy seems to be normal." One demon replies, "That's odd, the barrier should have drained you of demonic energy." The leader of the Shadow warriors explains, "Not really, the barrier he created was made to completely devour a full demon not drain it's powers. None of us full demons would have been able to even take two steps with in it, let alone run through it.The barrier was not fatal for her because she is half human but it was still very dangerous for her; if she had spent too much time in there, she would have suffered a horrible death. You really came through Nephra, You saved us." She smiles and says, "I'm just happy that everyone is back on the mountain safe and sound again. Just then Goju appears hovering in the air, He is very angry as he shouts out, "You killed my devoted servant, you will all pay for this !!" The leader of the Shadow demon shouts back, "Get out of here Goju, You've lost and you are no longer of any use to The Shadow Warriors, as I've stated before!!" he replies yelling, "You would all be dead right now if it wasn't for that meddling brat!!" Just then he shoots aiming directly at Nephra with his demonic power as a ball of powerful light comes speeding right for her. Nephra is caught off guard by this causing her to scream but Heroshya is extremely quick to jump in front of her and knock the ball of light with his sword causing it to fly right back at Goju who is almost hit with his own strike as he jumps out of the way just in time. Goju shouts from the sky, "Kid, You'd better watch yourself, you really don't want to become my enemy I assure you." Heroshya responds yelling angrily, " When you attack my sister, you automatically become my enemy!!" Without another word said Heroshya transforms into his true dog form and swiftly flies up to where Goju is. Goju also transforms into a horrifying beast as he is ready to take Heroshya on. As he flies up, Heroshya opens his mouth full of sharp deadly fangs and teeth intent on destroying Goju with one strong, powerful bite but Goju avoids this and grabs the powerful dog demon by the neck but he is also unsuccessful in his attempt to strangle him as his hand is clawed instead. The group of Shadow Demons, Nephra and the Dragon all watch from the ground as Heroshya and Goju swipe their claws and charge at each other from the sky. Goju charges one final time with much force and is able to push Heroshya backward proceeding to instantly bite his arm with his strong jaws, causing Heroshya to let out a roar of pain. Heroshya then uses his free arm to claw Goju on the side of his beast body causing him to let loose his grip on Heroshya's arm. Goju glides down to the ground and Heroshya follows him. Once back on the ground they both face each other and turn to humanoid form. Heroshya unsheathes his sword as his battle shirt is now stained with blood from his wounded arm, Goju also stands and rips his own shirt off to examine the long, deep scratches and blood dripping from his side. The other shadow demons shout, "C'mon Let's help Heroshya!" the leader replies, "No, He has challenged Goju to this battle and he would not want us to interfere. Our only action will be to guard Nephra while he fights; besides, I would like to see how he handles such a formidable foe." Goju uses his powers to cause his sword to appear as they run toward each other slashing and crossing blades as they jump and maneuver around each other's strikes. Goju and Heroshya are both highly skilled in their swordsmanship and the shadow demons take notice, "Look at that, Heroshya wields a sword as if he has hundreds of years in experience." Goju speaks to Heroshya in the middle of their battle, "I'm impressed with you kid, why not partner up with me, we can create a group of our own....I have no gripe with you really." They continue to battle as Heroshya replies, "But I have a gripe with you, No one will strike a sweet girl like Nephra and remain alive, Not so long as I'm around." Nephra hears this and she is so happy but says nothing as she continues to watch. Goju responds, "I am offering you power boy, you will give that up because I attacked some half breed brat!!" Heroshya's anger grows with Goju's words, "Absolutely...I will protect her with my very own life!" Heroshya strikes his final blow as he charges swiftly and strikes his sword directly into Goju's chest. He takes a moment to die and as he stumbles trying to recover from the wound, Heroshya assures that he will not live as he strikes his sword once again sweeping the heavy, sharp blade across Goju's midsection causing him to perish instantly. Nephra runs to her brother and says, "Heroshya you were amazing, He didn't have a chance! " Heroshya tells Nephra, "C'mon I'm taking you home before anything else threatens your life. I don't want to risk being punished by father." Nephra inquires, "But what about the agreement, I still have two more tasks to finish." The leader of the Shadow Warriors tells Nephra, "There is no need to finish the test, I've seen all I need to. Heroshya....If you are still interested in joining us, we meet here at the Western Mountain to discuss our next missions and spar with each other. We'd be honored to have you." The other Shadow Warriors are in agreement as they nod their heads. Heroshya Nods back and tells Nephra, "Let's go." Nephra tells the dragon, "C'mon Shiyana" Heroshya looks back, "Who is Shiyana?" she replies, "The dragon of course." Heroshya says, "No, it's not coming with us. There's no room for it at the empire." Nephra argues, "There's always room." Heroshya argues back, "I said No, The empire is packed full of demons already and what about Au Un, you might hurt his feelings." Nephra debates, "C'mon we can fit one more and besides Shiyana is a girl dragon, Au Un will be happy to have her around." The Shadow demons listen as Heroshya and Nephra argue back and forth about it as the leader whispers, "I'll bet Heroshya gives in, He's a softie for her even though he pretends not to be." Another demon whispers back, "He won't give in, she has to follow his orders." The Shadow demons all bet each other secretly as some think that Nephra will win the argument while the others think Heroshya will enforce his authority. Back at the castle Zephra sees that the sun is ready to set, it is almost night as she is very worried about Nephra wondering why she has not returned back from the Western Mountain, she sits with Au Un and Jaken near the meadow looking for Nephra to return. Zephra states, "I can't imagine what she could be doing all this time." 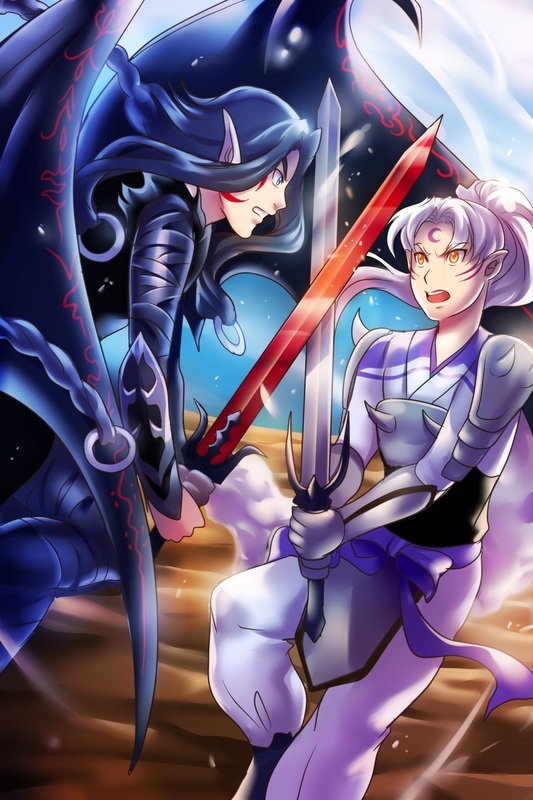 Jaken replies, "Enough of this Zephra, We've got to tell Lord Sesshomaru!!" Zephra responds, "But father will be furious and punish her, Just give her a few more minutes, She'll be back soon, I know it." Jaken argues, " We can't wait any longer, Even now she could be somewhere badly hurt." Zephra gives in, "Maybe you're right." They start to leave when Nephra yells out, "Zephra, Jaken!!" Zephra looks back and sees Nephra walking with Heroshya and a three headed dragon as she runs to her and says, "Where have you been Nephra?? We thought you might be hurt, Jaken almost went to tell father." Nephra replies, "We got into some trouble but we're both okay now." Heroshya jumps in and directs his comment to Jaken, "Well, you should have told father, Nephra had no business running off to the Western Mountian..especially without permission. It would serve her right to be punished.... It's your job to keep them out of mischief Jaken. " He walks off abruptly on his own toward the castle and Jaken runs off with him nervous that he might be punished, "Ahhhh, Uhhh wait Heroshya...I didn't realize she had run off until much later." Zephra watches as Heroshya storms off and she sticks her tongue out at him again as his back is turned, All the time Nephra remains happy and smiling. Zephra asks, "What if Heroshya tells father on you?" Nephra replies confidently, "He won't." Zephra again inquires, "How can you be so sure?" Nephra replies, "I'll tell you all about it later." She points at a sight near by, "Look." Zephra looks over and the two dragons are warming up to each other as they nuzzle and make small roaring noises. Zephra asks, "Where'd you get it?" Nephra responds, "From the Western Mountian, I named her Shiyana. Heroshya let me keep her." Zephra is shocked as she says, "I don't know how you could have ever gotten Heroshya to do something nice for you." Nephra giggles, "At first he wouldn't let me keep her but then I just pretended to be really sad and he felt so bad that we went back for her." Zephra's eyes raise, "Heroshya did that??" Nephra responds, "Of course, I knew he would because he's our brother and he loves us. There's nothing he wouldn't do." Zephra thinks to herself: hmmm, Now I really want to know what happened on the mountain.